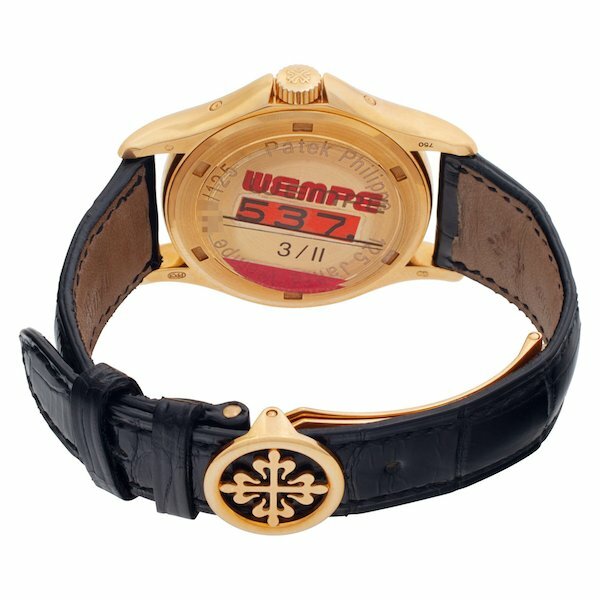 With a history that stretches back more than 140 years and five generations, Wempe is a leading retailer of high-end watches and fine jewelry. The German-based family business is also a great partner of Patek Philippe. So much so, that in 2003, on the occasion of Wempe’s 125th anniversary, Patek released a special collection of anniversary annual calendar watches. Today we’re highlighting a limited edition Patek Philippe Annual Calendar Wempe 125th Anniversary. When Patek Philippe debuted the commemorative Wempe Annual Calendar ref. 5125 models, they made them in four metals: yellow gold, white gold, rose gold, and platinum. Patek only made a total of 475 units of the ref. 5125–which makes this model highly collectible. Each gold model is limited to 125 (of course!) pieces and the platinum version is limited to 100 pieces. The Patek Philippe Annual Calendar Wempe ref. 5125J-001 we have here is the 18k yellow gold version, the ref. 5125J. Just as a refresher, the letters at the end of Patek reference numbers represent materials. J is for Jaune (yellow) gold, G is for Gris (gray) gold (better known as white gold), R is for Rose (pink) gold, and P is for Platine (platinum). 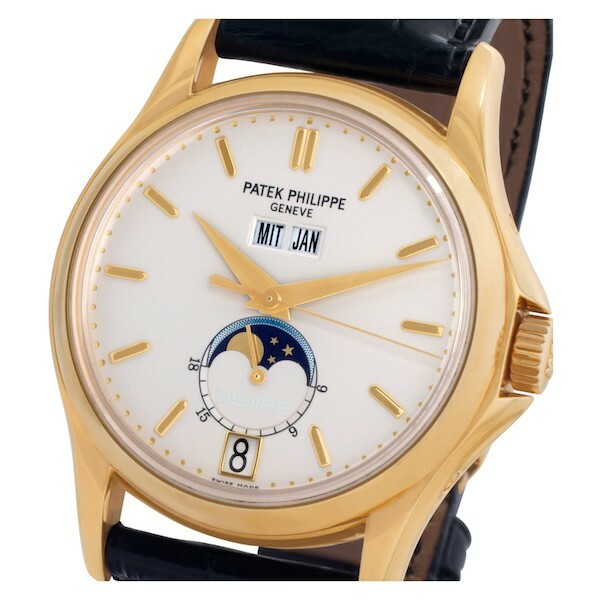 As many of you may already know, Patek Philippe invented the annual calendar complication in 1996. As its name suggests, an annual calendar watch only requires one adjustment a year (when February turns into March). Other than that, as long as the watch keeps running, the watch correctly indicates the time, day, date, month, and moon phase all year long. The Patek ref. 5125J sports a wonderfully proportional 37 mm case. 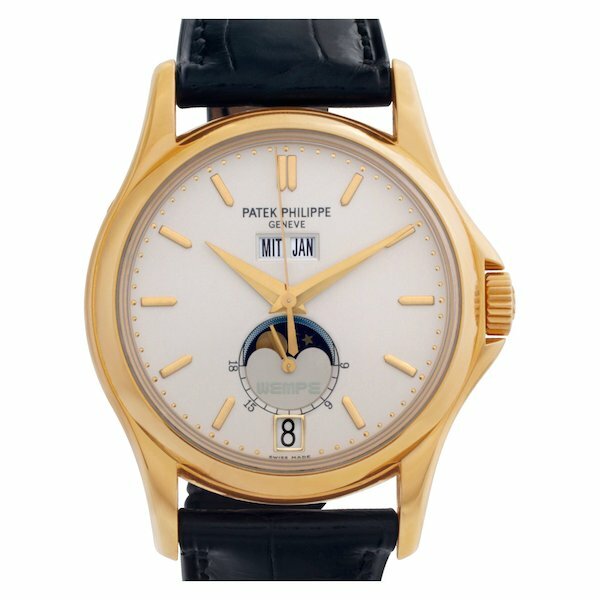 Housed within the yellow gold case is an ivory dial with the familiar Patek Annual Calendar layout. The double windows for the day and the month sit right under 12 o’clock. Appropriately, as a tribute to Wempe, these calendar windows are in German. On the bottom portion of the dial are the moon phase display and the date aperture. At the center of the dial are the dauphine-style hands in solid 18k yellow gold that point to 18k yellow gold indices. Those familiar with vintage Patek Philippe watches will immediately recognize that the Annual Calendar ref. 5125 takes its design cues from the iconic Perpetual Calendar ref. 3448. Completing the elegant look of this limited edition Patek Annual Calendar watch is a black leather strap. Naturally, the strap is fitted with the famed Patek Philippe Calatrava Cross deployant clasp, also in solid 18k yellow gold. 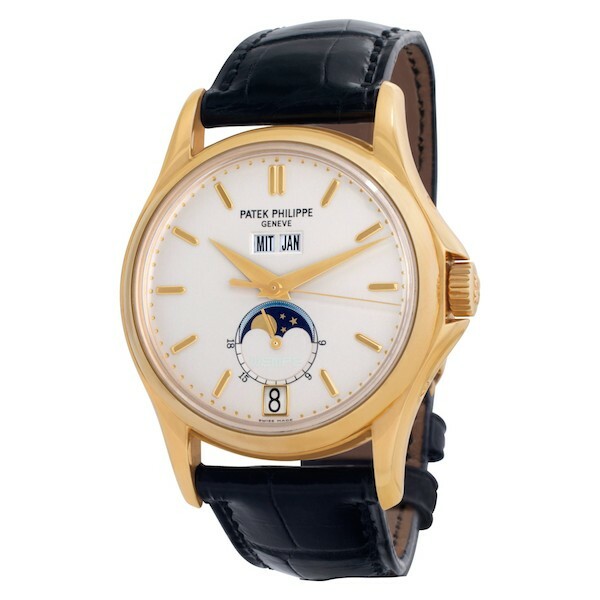 The Patek Philippe Annual Calendar Wempe 125th Anniversary watches are automatic watches. They run on Caliber 315 S IRM QA LU, which has a power reserve of 48 hours. If you flip the Patek ref. 5125 around, you’ll be greeted with a solid caseback. And on that caseback is the watch’s limited edition number. This example is numbered 019/125. 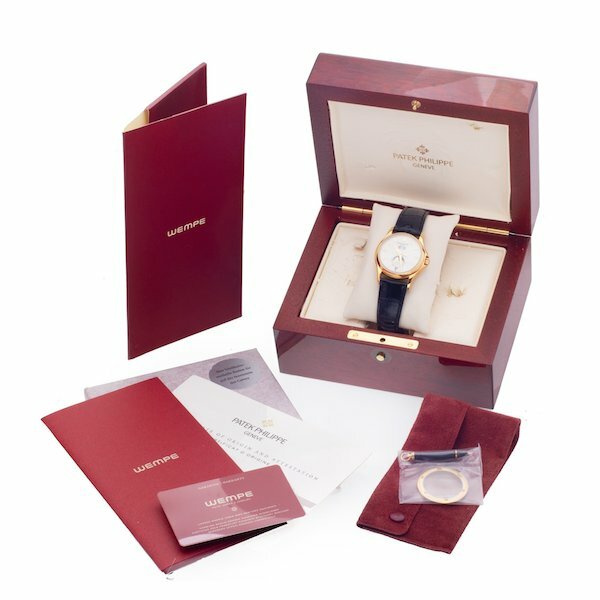 However, the set comes with an additional sapphire caseback should you wish to install it on the back of the Patek ref. 5125J for a view of the beautifully decorated Caliber 315 S IRM QA LU working away inside the watch. Limited, collectible, and oh so gorgeous to look at, the Patek Philippe Annual Calendar Wempe 125 Anniversary ref. 5125J is a very special timepiece indeed. Even better is that this specific example has never been worn, so it is as good as new!